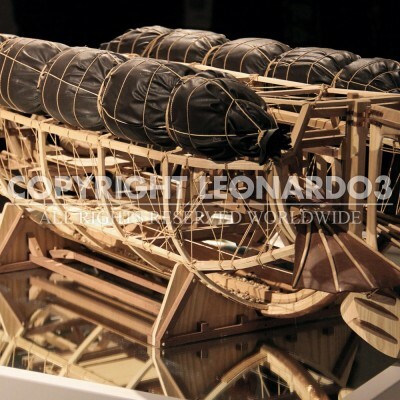 This secret and diabolical weapon is dangerous and innovative, and Leonardo was planning to propose it in Venice. However, like so many of his innovations and inventions, it was probably never built. The submarine’s war-related function is clear: it was meant to sink enemy ships using “you know what” secret instrument. He was referring to an object that he knew but did not even want to describe; perhaps for fear the design would be copied. The elements and schemas of this secret weapon are distinct, shown in cross section and distributed across the folio in such a way that makes them difficult to understand. Perhaps this was precisely Leonardo’s intent. He even worried about this machine’s excessive cruelty and efficiency. Ropes attach the mechanical submarine to a normal boat unrelated to war, which can sneakily approach the enemy undisturbed. 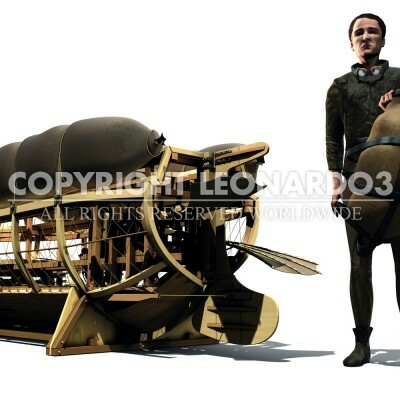 The diver enters the submarine unseen and detaches it from the boat to navigate underwater until he reaches the hull of the enemy ship and sinks it with cunning sabotage devices. Once detached, the machine is autonomous and the pilot can drive it in any direction using mechanical systems and fins moved by his feet. The two buoys can be used both as deep-sea stabilizers and as an air supply.